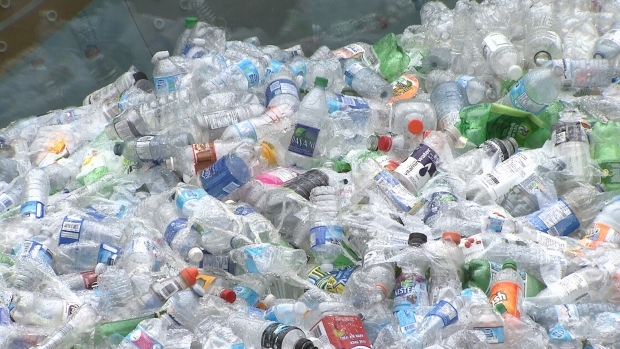 OTTAWA -- The country's plastics makers have set their own targets for keeping all plastic out of Canadian landfills by 2030. The announcement comes just days before the federal government asks other G7 nations to sign an international commitment to get the world on the same page on plastic pollution that harms marine life and forms islands of garbage in the oceans that can be larger than many countries. Isabelle Des Chenes, an executive vice-president at the Chemistry Industry Association of Canada, says the targets are in part designed to get ahead of government regulation, since Canada is in the consultation phase of a national strategy to curb plastic pollution. "I think it demonstrates as responsible care companies we have to continually strive to do better," she said. Together with the Canadian Plastics Industry Association, the chemistry association has set 2030 as the deadline for ensuring all plastics produced in Canada can be recycled into new products, or recovered. The two organizations jointly released their own targets to make all plastics recyclable or recoverable by 2030. By 2040, they want all plastics reusable, recyclable or recoverable. Reusable plastics are those that can be cleaned and reused for their original purpose. Most single-use plastic bottles cannot now be reused because they break down or degrade easily and bacteria can't be properly cleaned from them. Recyclable plastics are those that can be melted down and blended with raw materials to make new products, like clothing, sleeping bags, carpeting and decking materials. Recoverable plastics are those that are broken down into parts and often used as feedstock to create energy. The 2030 goal set by the plastics industry is five years longer than the 2025 zero plastics waste request proposed Monday by more than 40 environment groups and other non-governmental organizations. Those groups, including Environmental Defence, the Sierra Club of Canada and the David Suzuki Foundation, outlined a number of steps Canada should take in a national plastics plan, including aiming to have no plastic going into landfills within seven years. Canada wants to get the weight of the G7 behind a global push to eliminate plastic pollution and this week will present a plastics charter to G7 leaders at the summit in Quebec. Environment Minister Catherine McKenna has previously said the charter would have four main components: targets for reducing the amount of plastic waste produced, domestic strategies to meet those targets, working with industry to develop better products to replace plastic or make plastics more easily recyclable and assistance for the developing world to adapt better waste management. McKenna says the plastic waste Canadians discard each year is worth money, over $100 million each year that just ends up in the garbage dump. A number of private companies including Pepsi and McDonald's, have already released plans to cut their own plastics use and countries like Britain and France have taken steps to ban certain single-use plastics like straws and cutlery. In April Prime Minister Justin Trudeau was criticized for not introducing any such bans in Canada ahead of his G7 plastics charter plan. Des Chenes said banning plastics straws would not actually do a lot to cut plastics pollution, but would help draw public attention to their own role in reducing plastic waste. Aiming not to put any plastic in landfills by 2030 is "ambitious" but is realistic if governments of all levels provide enabling policies and funding supports to help develop new technologies and more innovative products. There are some barriers to the goal, because many plastics now cannot easily be recycled and municipal recycling programs often refuse many types of plastic because they are too hard to recycle or recover.